fish, fishing, learning. lakes, Outdoor Fun, stanborough lakes, wildlife. Today we have spent our day over at Stanborough lakes learning how to fish, we spent the day with Ian’s mum and dad, Ian’s dad has been fishing for years and has loads of experience so he has been showing us all how to fish. 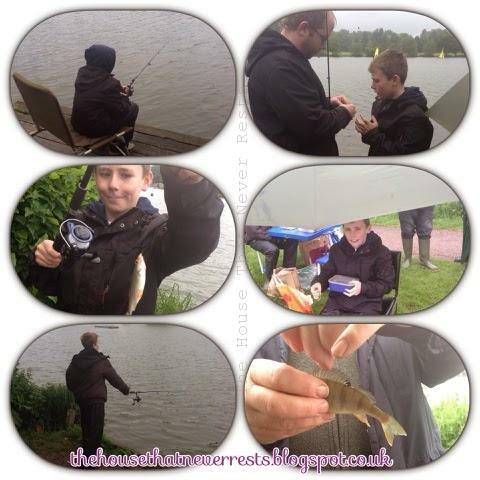 We was unsure if the boys would enjoy fishing but they absolutely loved it, we have a fishing holiday booked for August 2015 so we need to get loads of fishing practise in before then, we hope to try and go a few times a month, we have so far purchased ourselves a basic starter fishing set and we will build on this over time. We have a love for the outdoors and fishing is our new found hobby, so far we are all really enjoying it, today has been great fun, the boys had taken to it really well, they listened to their grandad and what he was explaining to them, there was lots of laughter and it was great fun. The weather was not great but we made the most of the day, we had a good few hours of dry weather then the rain started but it did not stop our fun. It was nice being able to spend that quality time all learning something new together, Ian has been fishing before but as a young boy and this is something he would like to take up again. Bradley was the first to catch a fish but he was amazed at how many fish grandad was catching so after a while Bradley decided he wanted to use grandads fishing rod, the boys had their first experience of touching maggots and putting them on the hock, they also learnt how to unhook the fish, we was amazed to see them enjoying themselves doing so.